The family-friendly Spectacular will be held from 5:30 to 8:30 p.m. Friday, Oct. 26 and 10 a.m. to 4 p.m. Saturday, Oct. 27 at ETHOS, (Encouraging Technology and Hands On Science) which is located at 2521 Industrial Parkway, Elkhart IN. JINA took part in Super Family Night to promote the upcoming Transit of Venus. JINA celebrated through 3 events. Wednesday evening, the JINA director hosted a conversation at a Science Cafe in South Bend. Thursday at 12:30, ND hosted the 2nd JINA webinar, available to any scientist who wanted to participate. Thursday evening, we held a Science Alive kickoff at the Centre Branch library in South Bend. 16 students at IMSA learned about nuclear astrophysics during their intersession. After four days of lectures and hands-on experiments, they presented their findings. CSI engaged Hoosiers of all ages in interactive STEM-related activities and discussions that would ignite their curiosity and imagination, encourage them to explore STEM-based education and career opportunities, and understand the importance of science, technology, engineering and mathematics to Indiana's future and the lives of its citizens. Participants from all walks of life learned first-hand about the commitment, dedication, and rewards that are inherent in STEM-based careers. 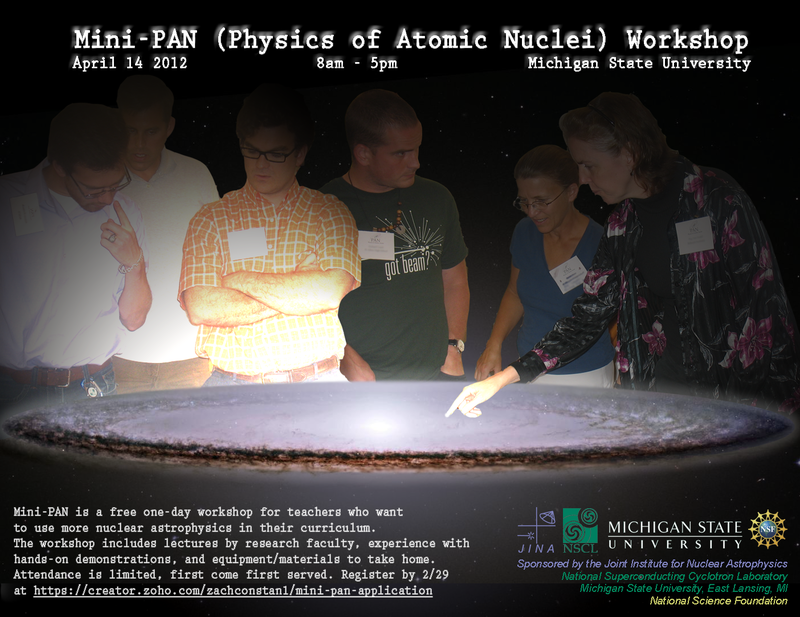 PAN is an outreach program that is held at the National Superconducting Cyclotron Laboratory (NSCL), located on the campus of Michigan State University. It is run by the Joint Institute for Nuclear Astrophysics (JINA), NSCL faculty and staff. Science educators and high school students participated in a program offering lectures, demonstrations, hands-on experiments. This is a summer science program for students 8 to 18 years old. This camp will utilize a multidisciplinary approach to learning, incorporating reading, writing, art and science. The participants will learn about the stars, planets and other exciting elements of space through reading books, creating art and hands-on experiments. This year’s Sensing Our World: Science Through Time program willexplore themes from Earth’s past, present, and future in biology, physics, chemistry, mathematics, and geology. Scientific processes occuron time scales fromnanoseconds to eons. Mathematics Science and Technology (MST) at MSU is a two week residential program for academically talented students who have completed grade 7, 8 or 9 in the 2009–2010 school year and a minimum age of 12 years old. The focus is on mathematics, science, and technology, and applications in these areas. The goal is to match the intellectual abilities of talented adolescents with rigorous and challenging course work which provides enrichment, but does not duplicate or accelerate course work that is part of the regular K-12 school curriculum. PIXE-PAN is a summer science program for high school students. Preference will be given to students entering their Senior and Junior years, but others may be accepted if space allows. Global Health Summer Science Camp: A week-long, all-day summer science camp at The University of Notre Dame that has been especially designed for students aged 11 to 14. MSU Grandparents University is a program for grandparents and grandchildren (ages 8-12) to come together for a 3-day educational experience while spending time together on the MSU campus. JINA invited 100 Washington High School 9th graders to come to Notre Dame for a day of talks, hands-on lab experiments and a program at the DVT (digital visualization theatre) in Jordan Hall. Classes were held at the Notre Dame campus Monday through Friday, from 9:00 a.m. to 4:00 p.m. Activities include meeting with ND scientists to learn about their research and visits to several different departments and labs on campus. Attractions included a self-guided tour showcasing the lab's control room, accelerators and detectors; hands-on science demonstrations; multimedia presentations; and a chance for informal Q-and-A about the Facility for Rare Isotopes Beams. The fields of science and technology was highlighted at the 17th annual Science Alive! This popular community event showcased the work of many organizations and individuals in the Michiana area with hands-on demonstrations and exhibits. JINAs "The Real Stars of Harry Potter" program was in the Presentation Room on the third floor of the Library, and ran hourly from 9:00 a.m. until 3:00 p.m.
(Magnetic) Marble Nuclei Exercises, CNO Card Games, and a tour of physics laboratories at Jordan Hall of Science. Outdoor Adventures Summer Day Camp, sponsored by St. Joseph County Parks Dept. for 1st and 2nd grade students, features JINAs Art to Science program all week at St. Pat's Park. More information available at the Parks Department, 574/277-4828. Alumni grandparents and their grandchildren are brought together at the campus each year for learning and fun, attending classes that range from archery to (of course!) astrophysics. The EYH Network program provided STEM role models and hands-on activities for middle school girls. More than 300 young women attended this year's conference at Notre Dame, where they attended workshops designed to nurture their interest in science and math courses and encouraged them to consider science and math based career options. JINA Outreach Specialist Mary DeWitt hosted workshops in forensic anthropology and archaeology. Relay For Life, the American Cancer Society's signature event, was a fun-filled overnight experience designed to bring together those who have been touched by cancer. At the children's area during family hours, JINA and MuggleNet® volunteers entertained and informed with a presentation of "The Real Stars of Harry Potter." Students from Redford Union High school delved into the problem of cosmic rays with a hands-on experiment at NSCL. The Catch a Cosmic Ray program included materials for teachers to use in class before and after visiting NSCL, turning it into a three-day lesson. Students, faculty, and staff of Robinson Community Center's Supernova (STEM) program enjoyed an evening tour of the three-accelerator Institute for Structure and Nuclear Astrophysics (ISNAP) lab at Notre Dame. Three JINA Junior Researcher Awards were presented at the Northern Indiana Regional Science @ Engineering Fair featuring projects created by students in grades 4 through 12, from public and private schools in St. Joseph, Elkhart, and Marshall counties. More than 130 special awards were presented to participants, including the JINA Junior Researcher Awards for projects involving nuclear astrophysics / physics, astrophysics / astronomy, or atomic / nuclear spectroscopy applications. The Notre Dame extended Research Community (NDeRC) and Notre Dame's colleges of Engineering and Science hosted an event on Saturday, December 1, at Notre Dame's new Jordan Hall of Science from 9 am to 2 pm. This gathering was meant to acquaint area teachers with the educational outreach and research opportunities available through Notre Dame. Additional information and online registration could be accessed at http://www3.nd.edu/~nderc . * Michiana Astronomy Society will also have telescopes on display. * For young adults, the CNO Cycle Card Game will also be on hand. JINA / NSCL high school student semifinalist in INTEL Science Talent Search: Jared Dunnmon, a high school student at The Summit Country Day School in Cincinnati OH and working on a JINA project within Michigan State University's High School Honor Science Program in Summer 2005 was selected as Semifinalist of the 66th INTEL Science Talent Search. His research paper presented results on X-ray burst modeling that he obtained in a JINA project carried out at MSU's National Superconducting Cyclotron Laboratory. JINA Outreach @ the Argonne National Laboratory Open House! JINA will have three booths at the ANL open house: 1) art to science with a special painting workshop from 1 - 4 pm by the South Chicago Art Center; 2) a CNO Cycle Card Game Tournament and play - win enough rounds and get your own set of the CNO card game playing cards; and 3) the JINA games - a few computers will be set up to take you on a fun and informative tours of various nucleosynthesis processes! Tours are available and much much more! JINA's summer science camp at ND, Sensing Our World, gets great press! See the article from the South Bend Tribune (7/19/06). JINA sponsored a special themed summer camp for 2nd and 3rd grade students at St. Pat's Park from July 10 - 15. Children created beautiful artwork and explored nature; the program ended with a public reception and presentation on astronomy. NASA has designated the University of Notre Dame as one of 50 official sites to receive and display a spectacular 4 x 6 foot, 100 megapixel photo print of the starburst galaxy M82, made and released in honor of Hubble Space Telescope's 16th Anniversary. JINA is co-sponsoring the events and the display of the new images at Notre Dame and at Kennedy Primary Academy. Public reception at ND-Downtown on Thursday May 3rd starting at 5 pm. There will also be events at Kennedy Primary Academy for students from across the South Bend Community School Corporation. SCIENCE ALIVE! -- now in its 14th year -- is an all day event in the main branch of the public library featuring all kinds of science and activities for the whole family! Come have fun with physics, chemistry, biology and more! October 7-8, 2005 At the ND Relay for Life, JINA had an ART to SCIENCE Project Kids Tent, staffed by the Saint Mary's College Women's Basketball team. JINA provided age appropriate books (ages 3-adult) to point children toward the stars, as well as crayons and paper and space for them to make art. Visit a world-class accelerator and explore the equipment used to measure reactions of rare isotopes. Find out what we are made of, and how stars explode! Special unveiling of new art from 3rd and 4th grade students from Bennett Woods Elementary School (Okemos, MI) who participated in JINA's ART to SCIENCE outreach project. JINA's ART to SCIENCE project at the Healthwork! JINA's ART to SCIENCE project went to the Science Day at the Healthworks! Kids Museum in downtown South Bend. Saturday, April 16, 2005, from noon to 4:00 pm. Kids explored stars and space in books and created art for us. The 3rd grade school children from Kerr Elementary in Durand, MI, explore space and stars in books and movies. They express impressions and reactions in art and poem. Kids Discover Astronomy: The JINA kids artwork exhibit in the Notre Dame Downtown center in South Bend attracted many visitors. These artwork were created by youngsters ages 3 - 5 in St. Louis. JINA’s reaching out to Grand Rapids for the Summer Learning Opportunities Fair on Saturday March 20, 2004 from 9:30 am to noon, promoting the Physics of the Atomic Nuclei (PAN) program for high school and middle school students and teachers, and the ART to SCIENCE project for kids ages 4 - 8.